A little later than expected (due to the fact I forgot to hit the publish button after writing my draft blogposts!) I've introduced a new feature called Bead Busting Monthly over on the Operation Tackle That Beadstash blog. When Sarah started the blog, her main aim was to help other beaders to tackle their bead stash one goal at a time. As the blog has grown, our individual goals have become a little less prominent and the contributing team has made a decision to go back to it's roots. But we wanted to make sure that we involve the blog's followers too - after all who doesn't want to see the beautiful things other people are making? And we all need a little bit of encouragement to dust off the beads we've been keeping for a 'special' project and just use them, right? As for my own goals, this month they are quite simple. 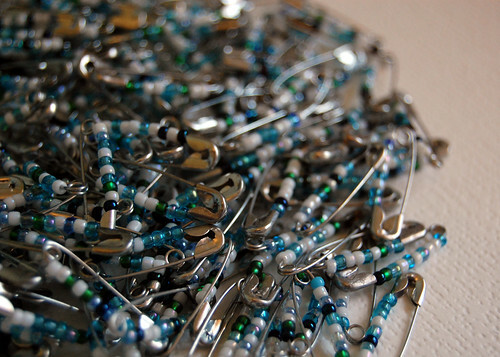 I'd like to focus on completing the bead embroidery piece I started for the April Moodboard; I'd like to create something for the May Moodboard and I'd like to finish a blue version of my Safety Pin Bracelet - the beaded pins have been sat there for months! Wanna join us in some bead stash busting? What will your goals be? I have actually go my jewellery kit out this week for the first time this year. Love the safety pins. Do you glue them / secure them shut somehow? Looking forward to seeing your finished embroidery. The pic I saw on the April summary was looking fab. Loving your colours for your safety pins too. Looking forward to seeing the finished pieces, good luck with your goals this month!